I was very lucky this year to catch a lot of movies at the Austin Film Festival. I’m including parts of the descriptions for each movie in blockquotes with commentary of my own after each. Former Sopranos writer Matthew Wiener has created a masterful tale about one of New Yorks most prestigious ad agencies at the beginning of the 1960s. Focusing on one of the firms most talented and extremely mysterious executives Donald Draper. Weiner will be on hand for a special cocktail hour screening of one of his personal favorite episodes of the beloved TV show. Weiner’s talk was the highlight of the festival for me. Why there was a TV-guy at the film festival I don’t know but I certainly enjoyed his talk about making Mad Men. We watched a recent episode: Guy Walks Into an Advertising Agency, which Weiner said was originally titled Nothing Runs Like a Deere. He said this episode was all about expectations and their anticipation. After watching it again with the audience, I saw many other ideas based on that theme. Most enjoyable was seeing the episode with a theater full of people. You forget how great the dialogue is, especially John Slattery as Roger Sterling. His timing is perfect and with a spirited, enthusiastic audience – had us roaring. Mad Men has been renewed for a fourth season too, so lots to look forward to. Ethan Inglebrink an eccentric agoraphobic heroin addict w ho is obsessed with his garden is searching for the perfect moment in a life that is running out of time. And the odds are against him. This darkly comedic tale set in small town California follows the last days of Ethan’s life as he struggles to find love and purpose – at a time when it might be too late to even matter. This movie was interesting, especially for the cast of actors (Diane Ladd, Rip Torn, Cloris Leachman, Val Kilmer, Peter Falk, Bruce Dern). The plot is odd, and meanders a little in the middle (ok, a lot) but it was fun. I ran into the star and co-writer Ronnie Gene Blevins, the next night in line and he implied it was quite an experience. I commented that they should have featured the donkey more in the trailer, as a donkey always equals comedy gold. The sharp-witted Byington returns with the Austin-shot story of Harmony a prototype nightmare dumpee – the sort of heartbroken friend you take out for consolatory drinks two or three times before resorting to any excuse to avoid hearing yet again the play-by-play rehash of what went wrong with his relationship. Never self-indulgent Byington creates a memorable modern comedy with subtle and sharp performance from his cast. Locally made here in Austin and starring lots of local talent. Nice to see some Austin locations, but once you know Austin, you realize some strange liberties are taken with the driving about town. The audience was really behind this film, which made it fun to watch. Good dialogue and a few strong scenes, but I couldn’t tell if most of the movie was improvised or not. Not that it matters. A dramatic comedy set in small town Rhode Island brings tog ether elements of depression romance and self exploration among a dysfunctional family of men. Lonely and frustrated after a bitter break up Caleb warns his younger brother against women especially the pretty young thing he’s bringing home for the holidays. His indifferent opinion and steely resolve is put to the test as his attraction to Peter’s girlfriend begins to grow. The Vicious Kind features a very well written script and inspired performances by Simmons Scott and Frost. Hard to classify, but interesting characters. I also didn’t know they had McMansions in Connecticut. With Houston We Have a Problem filmmaker Nicole Torre steps inside the world of Texas oil culture to understand just how the United States developed its large appetite for crude. Wildcatters independent oilmen and even the president of Shell Oil examine some hard truth s while discussing the history and the future of this limited commodity upon which we have become so dependent and weigh in on the future of this country’s energy supply. A talky documentary about the history of oil, mostly in Texas, and what we’ve got to look forward to next. A surprising range of opinions (some unintentionally humorous). My big takeaway was to invest in energy stocks, which might not quite be the point. In 1994 real-life crop artist Stan Herd traveled from Kansas to Manhattan’s Upper West Side to create a massive environmental artwork on land owned by Donald Trump. The multi-acre artwork was made from soil rock plants and vegetation near an underground railway tunnel. Stan recruited a number of homeless individuals living in the tunnel to become his crew. Over the months it took to complete the earthwork Stan dealt with a number of difficulties in bringing his unique rural art form to an urban canvas. In the process he unexpectedly encountered the true meaning of his art and it’s ultimate lasting rewards. Nicely cast and acted movie. The most surprising thing about it was that the director, Chris Ordal, mentioned in the post-screening chat that it was shot on location in Kansas instead of somewhere in New York. Also, a supporting role by the great Zach Grenier. What if you were a Hollywood movie star with an obsession for cars and racing? You would probably read every script with even the tiniest link to the subject matter in hopes that you could tell a great car story the likes of Grand Prix Le Mans or Mad Max. Then one day you open your garage door and sitting there right in front of you is the inspiration that gets you thinking about that old saying If you want something done right Eric Bana has now unwillingly cast himself in his own real life drama and it is a love story between Eric and the car he has owned since he was fifteen. We follow him from inside the race car to the surreal world of the red carpet. The personal and social pressures mount up in the face of re-building a car that means so much to him. Finely directed and edited movie. This surely had a larger budget behind it over most at the festival and it showed. Nice driving cinematography and some candid moments for Bana and his group of friends. A world that’s more riot than profession, the trading floors of Chicago are a place where gambling your family’s mortgage is all in a day’s work. Floored, at a time when markets are unhinged, offers a unique window to this lesser-known world of finance. These men may not have degrees, but they’ve got guts, and penchant for excess that solicits simultaneous feelings of revulsion and admiration. But like many aspects of our economy, technology is changing the way these traders do business, and these eccentric pit denizens aren’t the type to take kindly to new tricks. An interesting insight into some computer-phobic people. Very candid (and amusing) commentary by several interviewees. During the winter of 1846, a group of westward bound settler s is stranded in the Sierra Nevada Mountains. They must reach California for salvation, but without food and a guide, the group becomes disillusioned and decisions must be made so that others can stay alive. Inspired by the infamous Donner Party tragedy, the film is a harrowing look at survival and how far some will go to achieve it. This movie looked beautiful, and the performances were on target. I was reminded a lot of Deadwood. However, I felt that with the casting (Glover) I was expecting something a bit more divergent (quirkier). I left this movie about half-way through because of the disrespectful behavior of others in the audience. People on both sides of me had their phones out throughout the movie and the festival staff let others in late with some clamor. One late-arriving couple sat near me and chatted/mumbled amongst themselves continuously. The timely odyssey of Ryan Bingham, a corporate downsizer and consummate modern business traveler who, after years of staying happily airborne, suddenly finds himself ready to make a real connection. Ryan has long been contented with his unencumbered lifestyle lived out across America in airports, hotels and rental cars. He can carry all he needs in one wheel-away case; he’s a pampered, elite member of every travel loyalty program in existence; and he’s close to attaining his lifetime goal of 10 million frequent flier miles and yet . . . Ryan has nothing real to hold onto. When he falls for a simpatico fellow traveler, Ryan’s boss, inspired by a young, upstart efficiency expert, threatens to permanently call him in from the road. Faced with the prospect, at once terrifying and exhilarating, of being grounded, Ryan begins to contemplate what it might actually mean to have a home. In some ways it is unfair to compare this movie to the others. Obviously working with a much larger budget gives you a different kind of film. I’ll summarize that I liked it and remember hearing the book is interesting too. Reitman did a post-screening Q&A and was highly entertaining and talked a lot about his process writing (and re-writing) and directing. This entry was posted in austin, movies on October 30, 2009 by donturn. 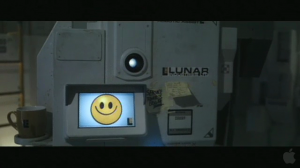 Gerty, from the Moon (the movie). And in comparison, Microsoft Bob – Wikipedia, the free encyclopedia. This entry was posted in media, movies, tech on July 26, 2009 by donturn. The Austinist has a short, but interesting interview with Don McKellar about his new movie Monkey Warfare. The Red Violin: tracking a violin’s path through history with Samuel L. Jackson (but no snakes or planes), a child prodigy, a Chinese musician in the era of Cultural Revolution and a love-triangle including the violin itself. Thirty Two Short Films About Glenn Gould : wonderful and insightful and you get to learn what Glenn Gould might eat for lunch. Twitch City: which recently came out on DVD and captures slacker Toronto, in the Kingston Market area perfectly. Watch this now. This entry was posted in austin, media, movies, tv, wishlist on March 9, 2007 by donturn. Don’t ante up for the new James Bond movie. This entry was posted in movies on November 17, 2006 by donturn. Some other guy in some other DVD 15th Anniversary Edition is Mr. Black. 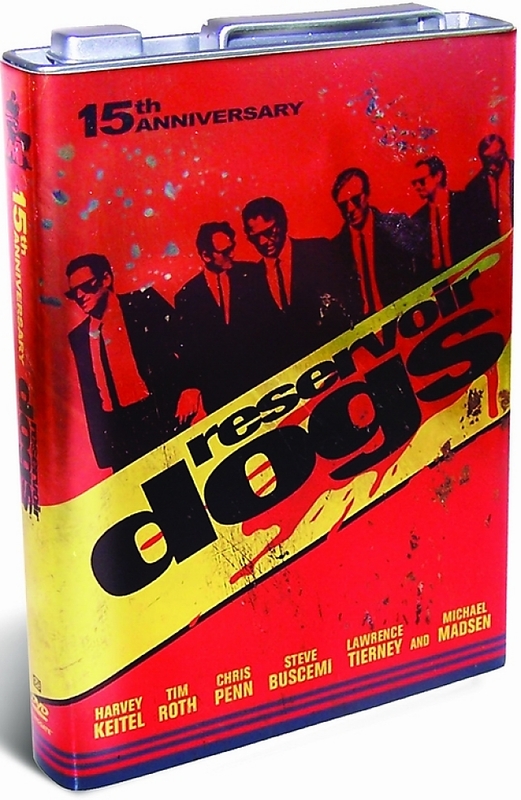 The Reservoir Dogs (15th Anniversary Edition) DVD is out. This entry was posted in movies, wishlist on October 26, 2006 by donturn. How do you beat Snakes on a Plane? With Blanks on a Blank, the film making challenge here in Austin at the Alamo Drafthouse. Check out the contest trailer too, it’s hilarious. Note: the newest Snakes on a Plane theatrical trailer takes itself awfully seriously. I guess you can only run a joke so far, but seeing the joke played out (at length), in action, is all this movie may have going for it. It would be nice to see if they could push it even further. This entry was posted in austin, movies on July 21, 2006 by donturn. “A guy goes into a bar and orders ten shots of brandy. ‘Give them to me,’ the guy says. The barman pours the ten shots and lines them up on the counter. on the floor. He drinks the remaining eight, one after the other. Why do Marlboro cigarettes have white filters in America, and yellow filters in Europe? So Keith Richards can tell which continent he’s on. This entry was posted in movies on April 20, 2006 by donturn. It looks like TiVo has given Mac users a Valentine’s Gift: TiVo Desktop 1.9.2. TiVo Desktop for Mac v1.9.2 Updated February 14, 2006. This update provides compatability with Mac OS X 10.4: Tiger. This entry was posted in macintosh, media, movies, tech, tv and tagged mac on February 15, 2006 by donturn. Too much hustle, not enough kung fu. This entry was posted in fun, movies on September 2, 2005 by donturn. Over at Futurismic: Blog, there is a claim that Google is trying to become the “modern equivalent” to the The Hitchhiker’s Guide to the Galaxy. The use of the word “modern” to describe Google now, when HHGG is (as far as I can tell) isn’t set in the past, but perhaps grounded in its original publication date. Either way, Google is better than when the book(s) were written, but certainly not as great as the Guide described in the books. I don’t know if that’s Google’s goal, but I think that Wikipedia is more in the spirit of the Guide. This entry was posted in books, fun, media, movies on February 25, 2005 by donturn.